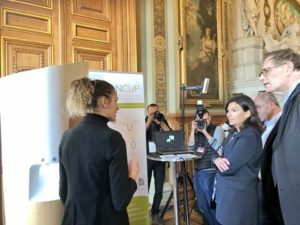 The Mayor of Paris Anne Hidalgo and her deputy Jean-Louis Missika have been able to discover our turnkey solution during the Hacking of the City Hall of Paris! 1100 startups were present at this crossroads of innovation in the heart of the capital. Thanks to the City of Paris, Paris&Co and Citeo for this event rich in meetings!